Lt. Gov. 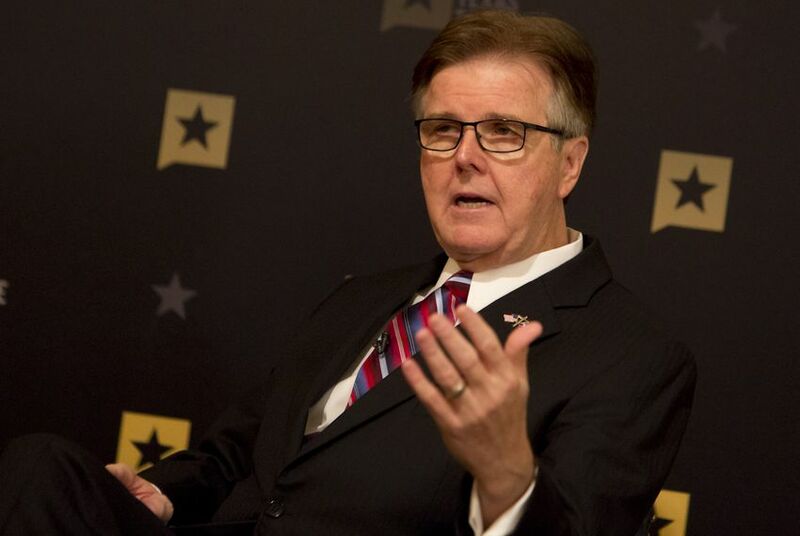 Dan Patrick fires back at criticism over "bathroom bill"
Patrick continued to fire back Wednesday at criticism of the so-called "bathroom bill" he has championed, saying its opponents are concentrated in the media. Lt. Gov. Dan Patrick continued to fire back Wednesday at criticism of the so-called "bathroom bill" he has championed, saying its opponents are concentrated in the media and denying that Texas could experience the same economic — and political — fallout North Carolina did when it passed similar legislation. "Every report of North Carolina shows that they have the second-strongest economy in the country or the second-best place to do business, the second best-place where executives want to move their companies to," Patrick said in an interview with Texas Tribune CEO Evan Smith. "It's having no effect." Patrick also said Wednesday he was not worried about a political backlash to the Texas bill, which he unveiled Thursday with state Sen. Lois Kolkhorst, R-Brenham. He disputed the idea that North Carolina's bathroom bill recently led to the defeat of its governor, Pat McCrory, saying it was Lt. Gov. Dan Forest who championed the bill in the state's legislature, while McCrory "sat on the sidelines until the very end." "If anyone should've lost an election, it was Dan Forest," Patrick said. "He got more votes than anyone on the ticket." Patrick complained vigorously about media coverage of Senate Bill 6, saying it overlooks polls that show broad support for the cause. The only people who oppose the bill in the surveys, Patrick insisted, are "Anglo liberals, and many of them work in the media." The bill is expected to face an uphill battle in the Legislature, where House Speaker Joe Straus has said the issue is not the "most urgent concern of mine." Patrick declined to say Wednesday whether he believes there is even enough support for the legislation in the chamber he oversees. "We will find out when we bring it to the floor," Patrick said, adding he is "always confident" but has not counted the votes yet in the Senate. He said the proposal is about public safety. "Does anyone in here who has grandchildren, have a granddaughter who's 8 or 9, want them to walk into a bathroom with a man?" Patrick asked the downtown Austin audience. In addition to criticism for opponents of the bathroom bill, Patrick also had strong words for foes of the state's A-F grading system for public schools and districts. Education leaders have fought the new system, which released its first marks earlier this month, saying it relies too much on state test performance. "Anyone who thinks in the education community that ... that system is going away — not going away," Patrick said. "If we can grade our students — if their futures are impacted like that — our schools should be under the same grades." "Now does the system need some tweaking? It may," Patrick said later Wednesday during a speech at a conference hosted by the Texas Public Policy Foundation, an Austin-based conservative think tank. Addressing more recent news in the Tribune interview, Patrick acknowledged lawmakers are facing a tighter fiscal picture than they did last session, especially following the dour revenue estimate Comptroller Glenn Hegar delivered Monday. Asked if the state could still afford additional tax relief, Patrick struck a somewhat less enthusiastic tone about the prospect than he has in recent weeks. "Well, like I said before, some things are pretty obvious," Patrick said. "You don't have as much money to work with this session. You have to meet the needs of our constituents and the people of Texas, and we will address that issue as we go along. We have a long way to go." Yet Patrick chafed at the suggestion that he was backing down from his longtime ambition of phasing out one unpopular tax, the business franchise tax. "My point is that our goal is to chip away at it each session, and how much we can chip away at that depends on the revenues we have," said Patrick, who has listed reducing the franchise tax as a priority this session. Another Patrick priority is private school choice, or using taxpayer dollars to subsidize parents who choose to send their children to private or parochial schools or to educate them at home. On Wednesday, Patrick reiterated his belief that implementing a school choice program is "linked together" with efforts to improve the state's public school finance system but stopped short of suggesting he would insist lawmakers not tackle one without addressing the other. "I don't hold hostages," Patrick told Smith. "It's not the way I operate." At the TPPF conference, Patrick vowed to fight for school choice as long as it takes, invoking previous battles he has waged under the pink dome. "Like the sonogram bill, like the 19-vote rule," Patrick said, "I'm not going away." During a news conference Wednesday afternoon, a group of tourism bureau presidents and business organization leaders said SB 6 created a problem “that doesn’t exist.” They introduced Texas Welcomes All, a campaign opposing the bill. Phillip Jones, president and CEO of Visit Dallas, said there have been “no major incidents” or attacks that would make the proposal an issue of public safety. Instead, Jones said, SB 6 portrays Texas as discriminatory and would discourage tourists and conventions from visiting the state. Similarly, Caroline Joiner, executive director of TechNet, a bipartisan technology association, said tech workers — an in-demand segment of the workforce — would be less interested in moving to Texas because of the bill. Texas Republicans' anti-LGBT proposals could cost the state up to $8.5 billion and more than 100,000 jobs, according to a Texas Association of Business report. The 10 most populous districts in the state received more Ds than As in the new A-F rating system, according to a preliminary report out to educators Friday. By comparison, the 10 biggest charters saw more As and a smattering of Fs. Disclosure: The Texas Public Policy Foundation has been a financial supporter of The Texas Tribune. A complete list of Tribune donors and sponsors can be viewed here.